I’m not a huge fan of food that inflicts pain, like nettle sandwiches or sulphuric acid quiche. I have a scar on the inside of my top lip that is as a direct result of food. It required 4 stitches to close and was the result of an over zealous attack on a lamb chop. Pretty foolishly, I refused to give up on the piece of meat until I had cleaned the bone, a bit like a piranha going at a chicken and in doing so I managed to turn the bone into a stabbing weapon hence the appearance at A&E. So this post is more a survival skills entry rather than my standard recipe blurb but it will serve you well, looks bloody good on a plate and will prevent oral injury should you be the type who refuses to leave anything on the bone. 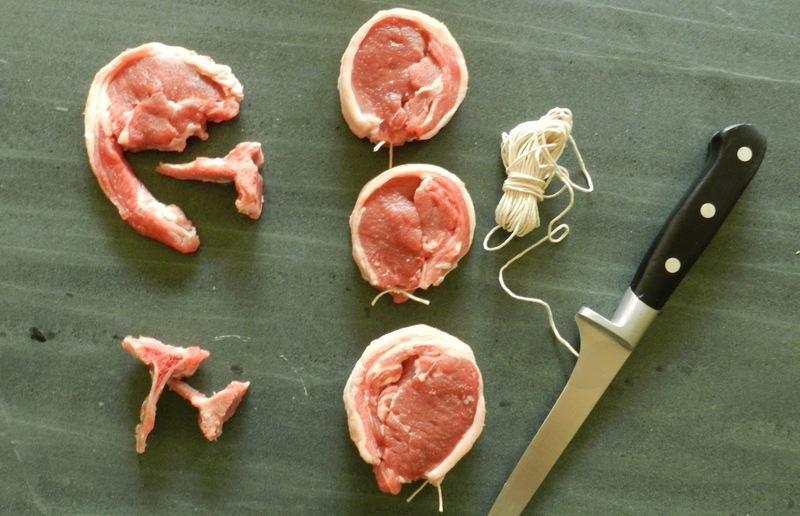 In order to turn your potentially lethal lamb chop into a passive yet stunningly beautiful piece of kitchen table eye candy then you really do need to get your hands on a boning knife. If you like doing your own basic butchery then it’s an essential piece of kit, but careful though as a brand new one (quality brand) will take your fingers off in the blinking of an eye! To turn the lamb in ‘Noisettes’ you need to extract the bone which is part spine part rib, have a look at the pic above and you can see the bone extracted – you literally just cut it out with the point of the knife leaving the meat and fat behind. You then wrap the piece of loose meat that looks like a tail back around the main fillet to create a dainty little circle. Its then just a simple case of either stringing or sticking (butchers string or cocktail stick) the noisette to maintain its shape during cooking. There are hundreds of things to do with the noisette now, a couple of examples would be to marinate the meat in rosemary and garlic oil then roast or dry rub with spices like cumin and chili, fry and serve with mint yogurt and flat bread. You can also do the same with large pork chops on the bone.